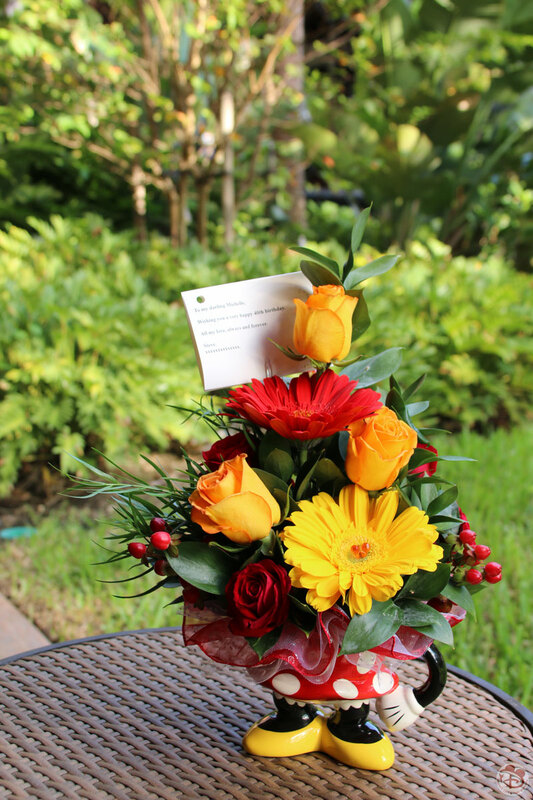 I mentioned earlier that Steve had organised a surprise for me from Disney Floral & Gifts – they arrived not long after we had settled into our room. 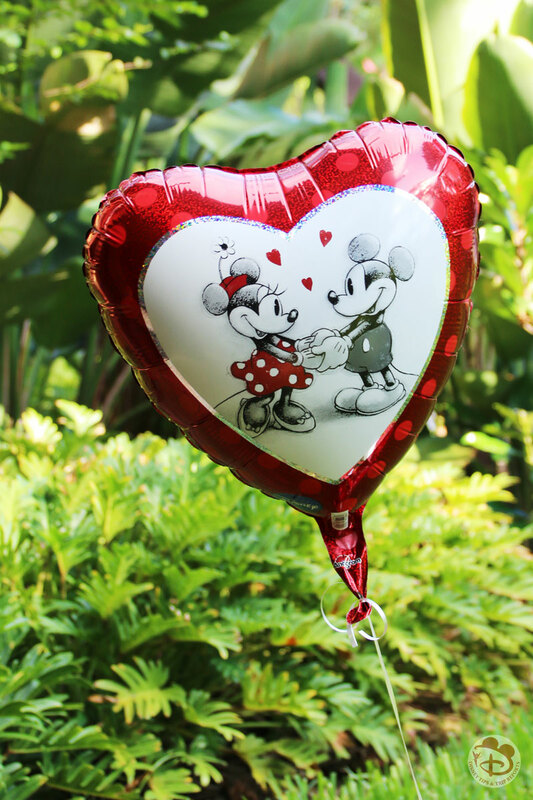 He had ordered me a lovely flower arrangement sat inside a Minnie Mouse cup, a bag full of Disney snacks, a bottle of fizz with Disney engraved glasses, and a bunch of balloons which were attached to one of those double sided pencil/pen cases – which Steve said he doesn’t remember ordering! The flowers were absolutely gorgeous, as you can see! I’ve had my eye on the Minnie Mouse cup for several visits, but have never got around to buying one – I now have her! She sits on my desk at home now. I didn’t take photos of the snacks – but they were the various kinds of snacks you can buy at Disney – trail mix, chocolate covered pretzels, popcorn, etc. 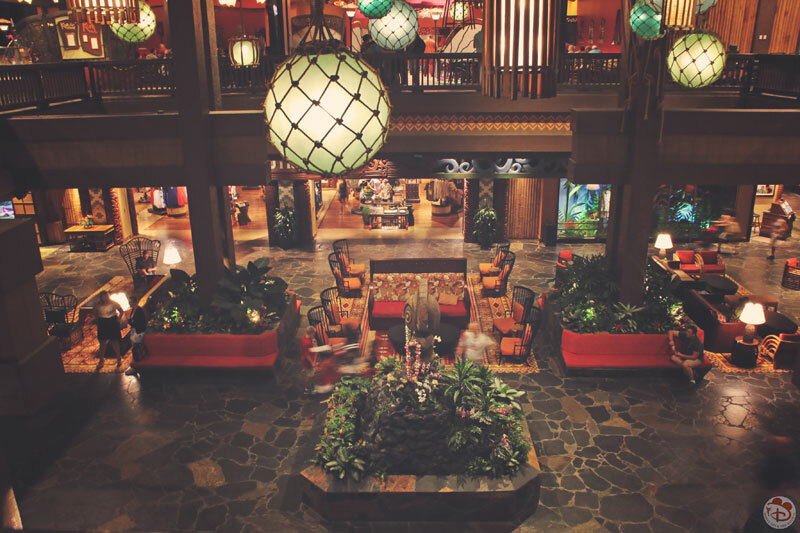 As the night started to draw in, we made our way to the Great Ceremonial House for our dinner reservation at ‘Ohana. We dined here a few years ago, and enjoyed it, so were looking forward to our first Walt Disney World restaurant meal of this trip. 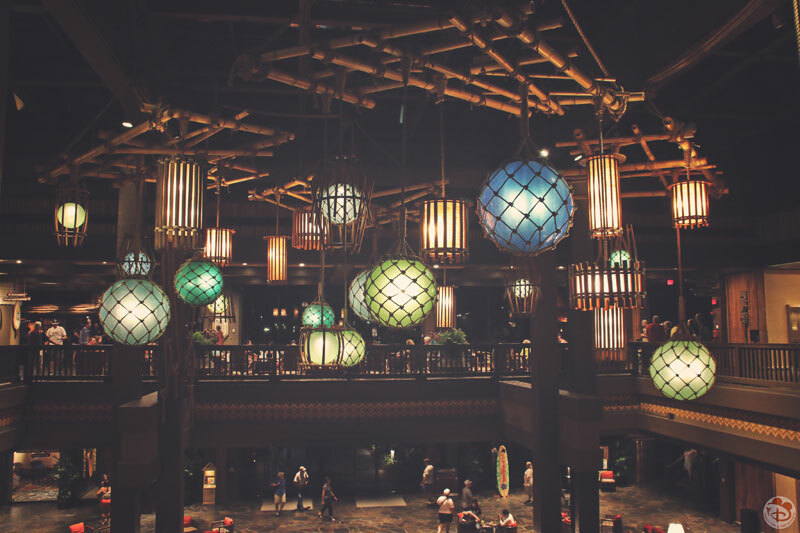 Before I tell you about that, here are some more photos from around the resort at night. 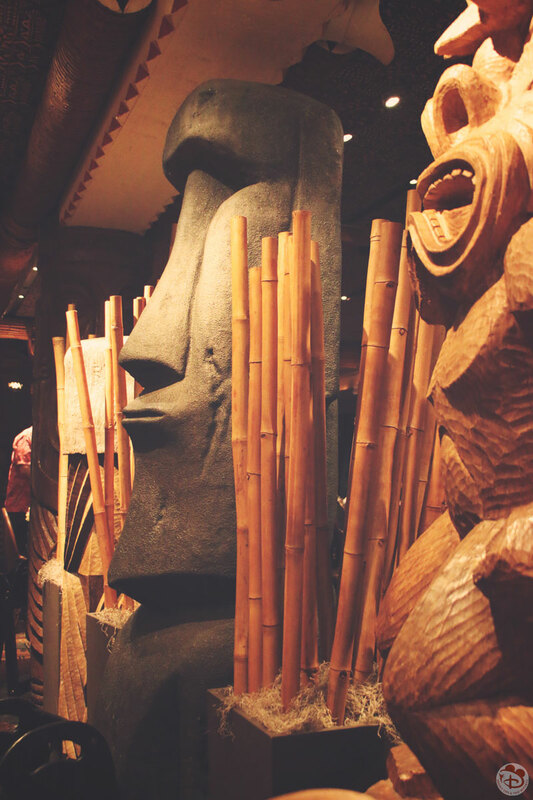 ‘Ohana is situated on the 2nd floor (1st floor for us Brits), and while waiting for our table to become available, we had a wander around up here, popped into Moana Mercantile. It wasn’t too long before our buzzer went off to indicated we could go in. We were shown to our table at the front of the restaurant, tucked away in the corner – I don’t know if the rest of the restaurant was full, but our table could have easily seated 6 people! I wasn’t complaining though, as it was nice to be in a different area from previous visits. 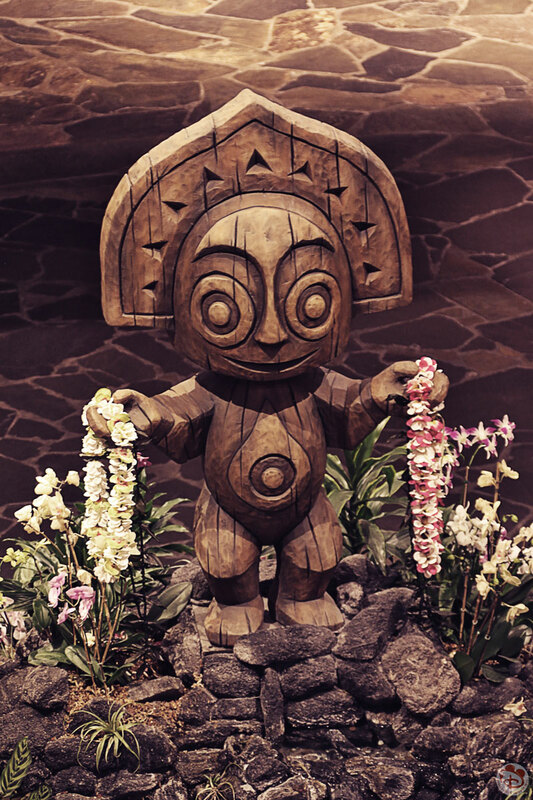 ‘Ohana is an all-you-care-to-enjoy Polynesian style feast, served over three courses. 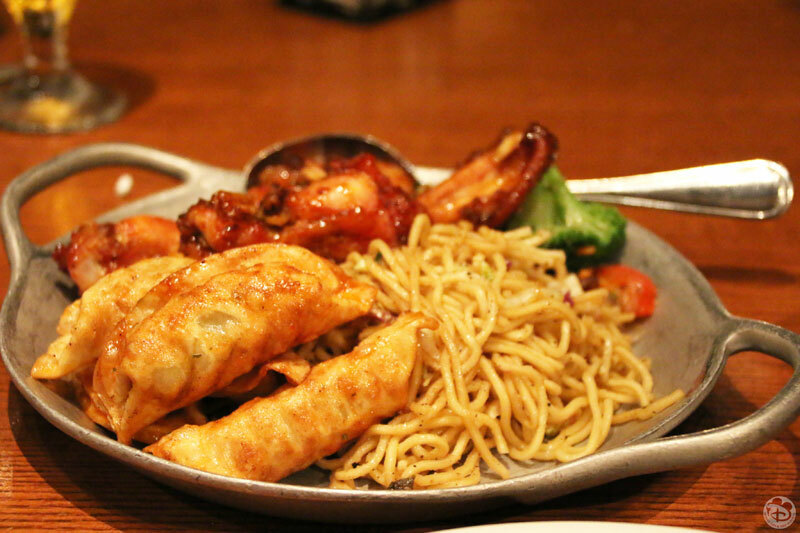 The starters are brought to your table for everyone to share, as are the sides, and the dessert. 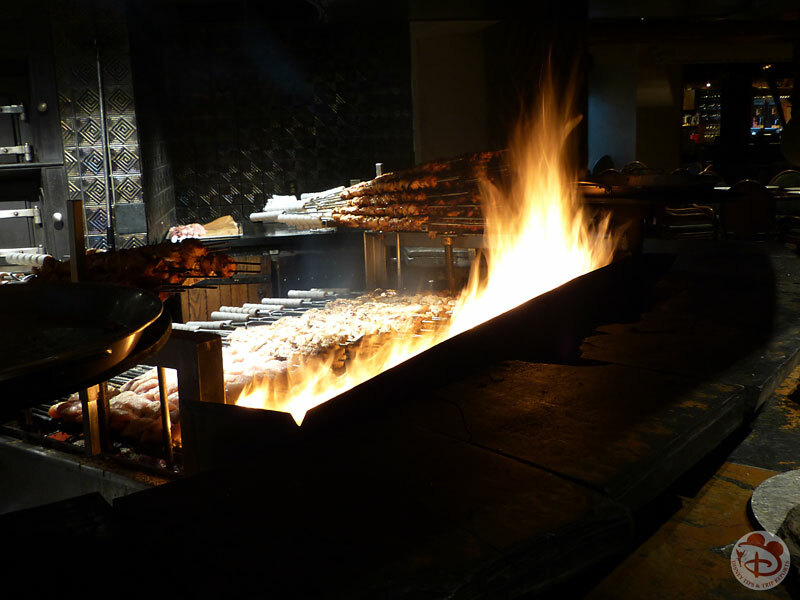 The fish and meat are prepared over an oak fire, which is the centerpiece of the restaurant, and brought to the table on long skewers and served directly onto your plate. A non-alcoholic beverage is included with the price of the meal. 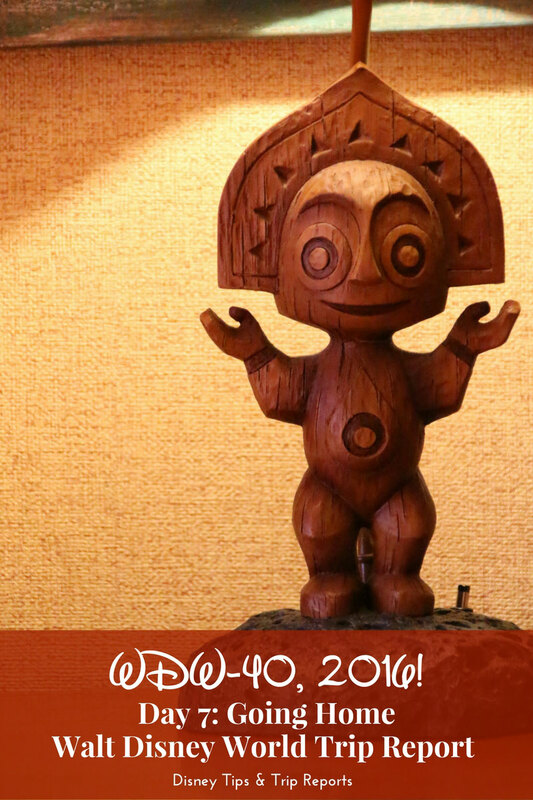 It is a set price for dinner at ‘Ohana, which varies – both seasonally, and weekday/weekend. 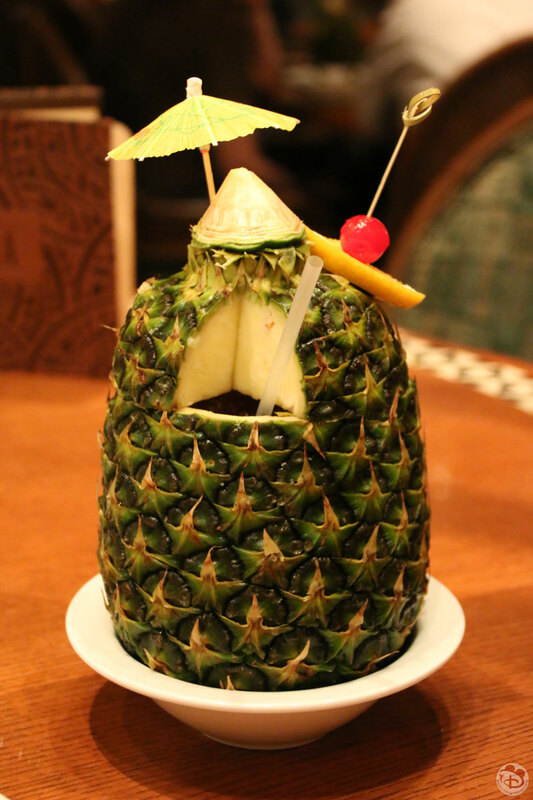 We paid $80 for the two of us, and also bought alcoholic beverages, including my much lusted after Lapu Lapu – not driving meant I could finally have one! My notes from the night tell me that the food was good, but not as hot as it could have been. 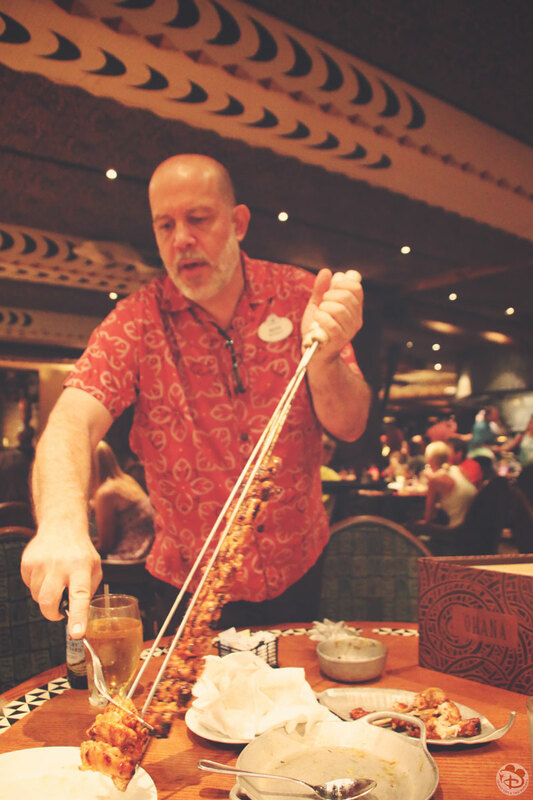 We have found that food across Disney restaurants isn’t always piping hot. 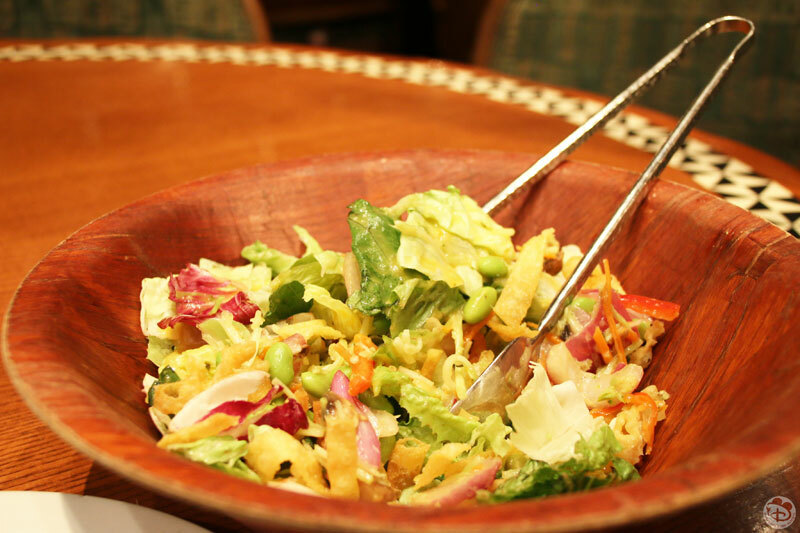 I really enjoy the salad here, and save it to eat with my mains. However, I know from our last visit that the server couldn’t wait to whisk the bowl away, so I made sure it stayed on the table! I’m very picky with chicken, especially when I haven’t cooked it myself, so I do tend to cut pieces open to check. The horror when I found a nice bloody piece… *boke* The rest of our chicken was fine, it was just that one piece that got away. I didn’t make a fuss, but quietly mentioned it to the server as he cleaned away our dishes. Next thing we know he’s back at the table with the Head Chef who came to personally apologise, and to say how he check the chicken, and said it was definitely cooked, but that it was “just a blood vessel”. Gross! 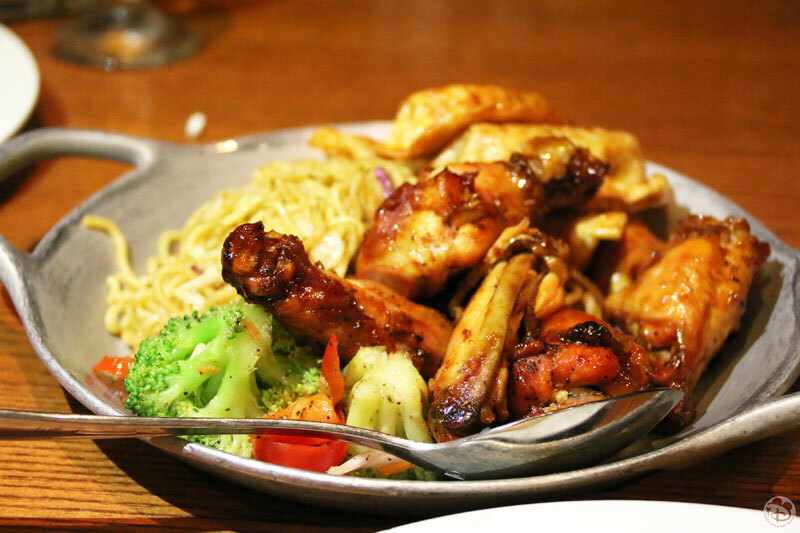 I explained that it was “fine” (in that I didn’t wish to make a fuss), but then our server brought us out more freshly cooked chicken and noodles… we were well and truly stuffed. 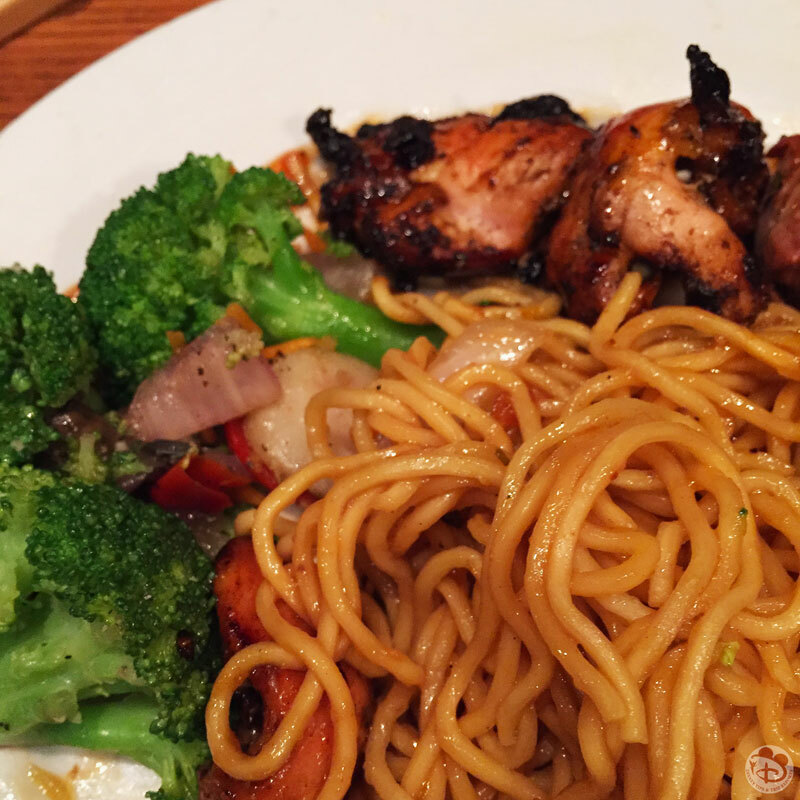 I couldn’t eat much more, but Steve… of course he did! At this point we knew we wouldn’t be able to manage dessert, so asked if we could take it to-go. 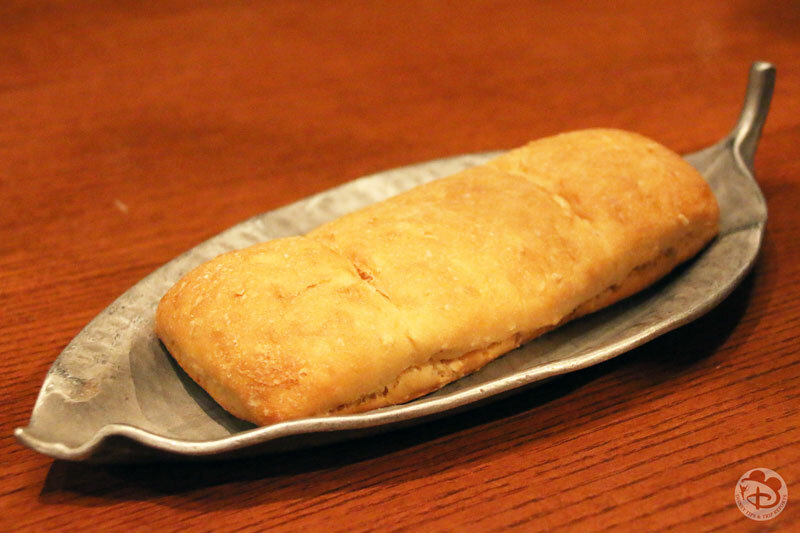 The server explained that they’re not allowed to do that at this sort of restaurant – not sure why? Maybe because it’s an all-you-care-to-enjoy? Who knows! 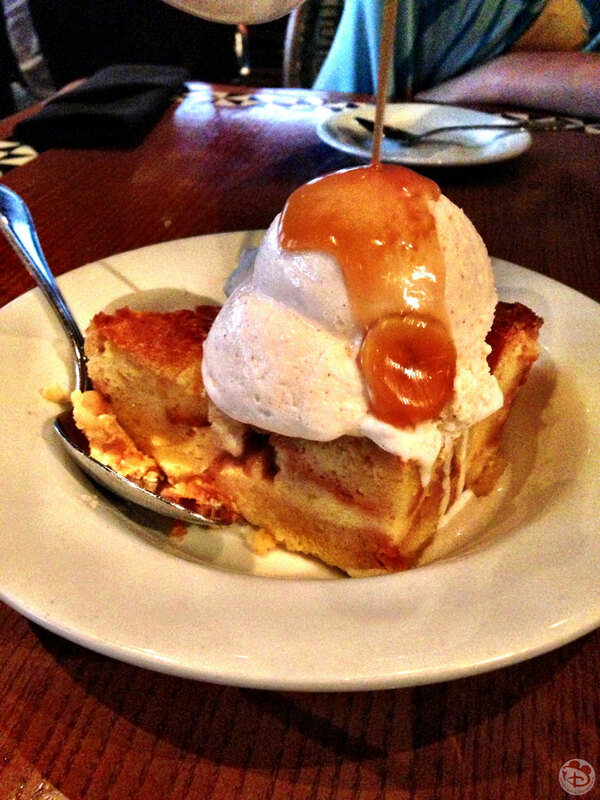 The ‘Ohana Bread Pudding is LUSH! I don’t actually have a picture of it, as in the end we did take it to go – I’ll explain in a second – so the picture below is from when we went in 2013! 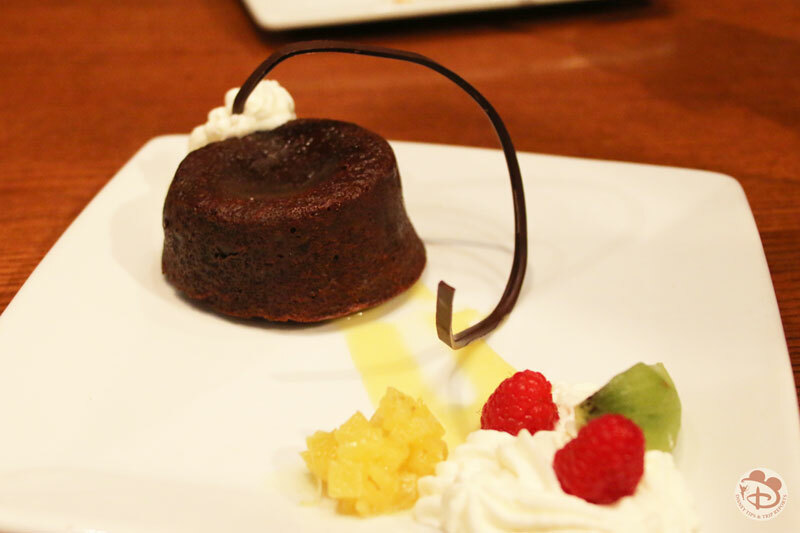 Back to the dessert situation. The Head Chef suddenly re-appeared at our table with a couple of bespoke desserts by way of an apology. He said he would also box us up some bread pudding to-go (which we ate for breakfast the next day!) Steve and I just looked at each other with faces of “how are we going to eat this too? !” We couldn’t just up and leave it – how rude!! 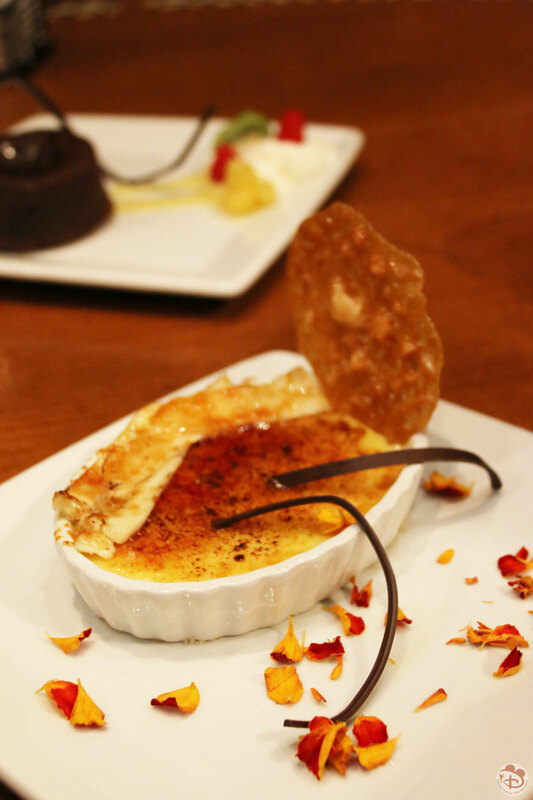 I couldn’t tell you exactly what the desserts were, because they are not on the menu, but it looks like a chocolate pudding and a crème brûlée. I couldn’t manage more than a polite spoonful. So Steve, with his hollow legs ate them up! We paid our bill, and used our Tables in Wonderland (TiW) discount card, and then exited the Great Ceremonial House towards the beach so we could see Cinderella Castle – it felt weird to be so close, yet without tickets until Monday, so far away! 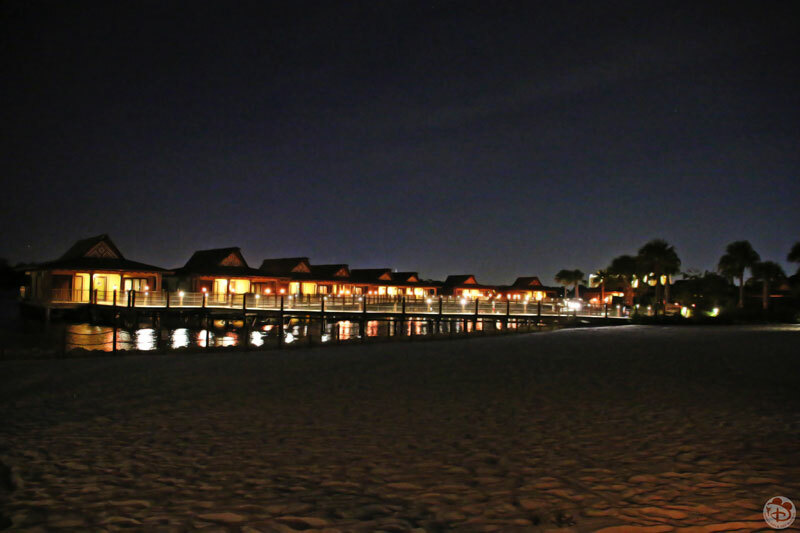 The Bora Bora Bungalows looked gorgeous lit up at night too. After our late night wander of the resort, we headed back to our room to crash out!